If you enjoy reading a good thriller, ripe with horror and delight, then look no further. For the Chaos Walking series by Patrick Ness will fit that bill perfectly with its unique and terrifying storyline. In the first book of the series, The Knife of Never Letting Go, you learn that the world can be a very scary place, and no matter how much you think you know you may never be right. Set in a world of "noise", Todd has never known silence- not in the sense that you or I have. Cursed with a disease from the Spackle, an alien race, a person's thoughts are no longer his and his alone. It's a dark and dangerous world, nothing like the settlers envisioned when they first came to this new planet. Yet it's the only world Todd has ever known. It's not a fun place necessarily, but it's home. And then a day comes that Todd must question everything he's ever been taught or thought true. In that day, Todd discovers the most horrifying thing of all- silence. Unlike anything he's ever known, Todd hears a silence so pure it could be almost maddening if it weren't for the fact that it is so amazing. Delving deep in to his search to discover the root of the quiet, Todd quickly finds out that much of what he's grown to think of as truth is infact complete and utter lies. Book 2, The Ask and the Answer, picks up right where it's predecessor left off. The trouble is, when they get to Haven it is anything but. For unfortunately they weren't fast enough. Choosing the path of least resistance, the town of Haven has given itself over to the invading army of Prentisstown. With its officials and leaders overthrown, the new law in town is the frightful Mayor Prentiss. Having promoted himself from Mayor to President, Mr. Prentiss has also renamed Haven to New Prentisstown. Sadly New Prentisstown does not appear to be any more serene or safe than the old. Quite to Todd and Viola's dismay, it may even be worse. In old Prentisstown you knew what you were getting, but here there's a feigned attitude of normalcy despite the government being overthrown, the segregation of sexes, and the general air of doom. Having managed to overcome so much opposition on the road, Todd and Viola are not prepared for what's about to happen them. Ripped apart almost immediately, the two are thrust into separate areas of the town not knowing what has become of the other. This is most especially difficult for Todd because when they arrived in town he was carrying his bloodied companion as her body struggled to withstand the damage caused to it by a bullet from Davy Prentiss' [the mayor's son's] gun. Todd is promptly detained and tortured; meanwhile, Viola is whisked away to a House of Healing where her wound can be properly taken care of. Days pass and neither have any indication as to what has happened to the other, only the empty promises from Mayor Prentiss that neither has nor will be harmed. Consistently pushing to gain Viola's confidence, the President tries to persuade her to his side. When the settler ships land, she will be his way in- his way to assure he stays in control. Viola doesn't trust him though, knows he's a devilish liar. And still something about the way he presents himself, something about the words he speaks make everything that much more believable. In the House of Healing where she was first taken, Viola discovers there is a plot brewing to upset the current regime. Not wanting to dine with the dragon but likewise not wanting to do anything that could have ill repercussions for Todd, wherever the Mayor might be keeping him, Viola treads lightly. Walking a high rope of uncertainty, she knows she has no other choice. Both sides present what could be a somewhat dependable story if only she didn't know so much already. Caught up in the pain of his loss and the helplessness of his confinement, Todd struggles to understand how he is to free himself, save Viola- if she's not already dead, and all the while make it out alive. Escape is all but impossible with his guard dog Davy always breathing down his neck. And then, when he least expects it, Todd sees his chance. The question is, could it be a trap? Just like the first installment of Todd's story, this book was an incredible and addicting read. Wrought with torment, anguish, and pain the character's came alive as their distressing tales were told and weaved together with just enough love and hope sprinkled in for good measure. Of course, since this is only the second book in a trilogy, we are left with yet another nail biting cliff hanger ending. The positive to this though is that book 3 is already out in the UK, Ireland, and Australia. We'll get it here in the States and Canada in September!!! That gives you just enough time to pick up your own copy of books 1 and 2 in the Chaos Walking series, before heading out for a copy of book 3, Monsters of Men when it hits the shelves. I can hardly wait!!! Want to read my complete and original review of The Knife of Never Letting Go? Click here. I never knew this line of books existed, but after reading Little Black Ant on Park Street by Janet Halfmann I know I simply must look into finding more books published by this company. Halfmann is a amazing author, and I have been a huge fan since I first had the opportunity to read and review her earlier title, Little Skink's Tail, published by the incredible Sylvan Dell. 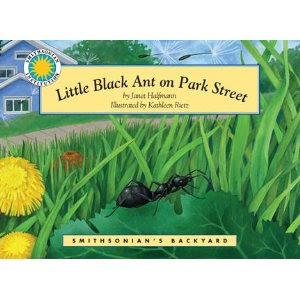 But back to Soundprint's Smithsonian's Backyard, and more specifically Little Black Ant on Park Street. If you have a young child who is interested in the how's and why's of nature, then I highly recommend this book. Accompanied by colorful and very realistic illustrations, this story documents the journey of a solitary little black ant as she goes through the day to day activities that comprise the life of one so small. Halfmann does a fantastic job of describing the design and function of an anthill and the hierarchy within. And in a language young children can easily understand, she explains how ants travel; search for food; and work as part of a group for the greater good. Who knew an ant's life would actually offer up some good life lessons that even we as human beings can learn from? Well, it's true. The tiny black ant displays an attitude of dedication, intelligence, independence yet with ties to a group oneness, and a strength of ingenuity. When life gets difficult or a job seems too big to tackle, the seemingly insignificant ant doesn't get upset, she simply finds a solution. Whether it is asking for help or keeping her head down and staying on the path, she gets what she needs to get done and finds fulfillment within the act and end results. It's a lesson I know I can use to take to heart. If a tiny little ant can accomplish so much simply by dedicating herself, how much more can I, as a person, accomplish if I set my mind to it? How great can my life be if I really apply myself? Yes, this book definitely provides some wonderful life and scientific lessons, but it also provides something more basic- pure entertainment. Watching as the little ant on Park Street goes through her day was both educational and full of heart. Coming from someone who generally can not stand ants, I'd have to say I really found myself drawn in to this book. Without a doubt, Halfmann has written another winner with Little Black Ant on Park Street. It's been my privilege to have this review opportunity. "Smithsonian's Backyard... is a world of wonder for children intrigued by the wildlife outside their windows. These entertaining stories answer many questions children have about the habits and habitats of the animals in our own backyards. The series excites children about reading and learning, using interactive storybooks, audiobooks and stuffed animal toys. This title was developed under the direct supervision of curators for the Smithsonian's National Museum of Natural History."